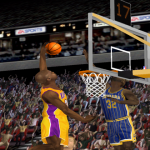 If you feel like reliving the days of NBA Live 2002 and NBA 2K2, when Shaquille O’Neal and Kobe Bryant were leading the Los Angeles Lakers to their third consecutive championship, seaboh13 has a mod for you! The 2002 Season Mod is available now for NBA 2K18 PC, and although it’s still a Work-in-Progress, it’s already in a playable state. As of now, each team has at least 12 players with correct ages, experience, and other bio data. Teams have been renamed accordingly, and retro art has been provided. Ratings are about 60% complete as of this post, but the mod is already MyLEAGUE compatible, with contracts updated ahead of the 2002 offseason. Want to see the mod in action? Shady00018 has put together an awesome preview trailer, which you can check out below! To download the roster, find it in 2K Share under the name 2001-02 In Progress, username seaboh. For the additional artwork, as well as further previews and information, please see this topic in the NLSC Forum. Stay tuned for further updates to the mod! This is Wayback Wednesday, your midweek blast from the past! In this feature, we dig into the archives, look back at the history of basketball gaming, and indulge in some nostalgia. Check in every Wednesday for retrospectives and other features on older versions of NBA Live, NBA 2K, and old school basketball video games in general. You’ll also find old NLSC editorials re-published with added commentary, and other flashback content. 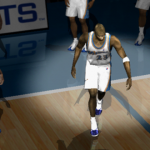 This week, my retrospective on franchise gaming continues with a look back at the mode that helped coin that term: the original Franchise Mode featured in NBA Live 2000 through NBA Live 2003. With GM Mode, EA Sports had experimented with altering the traditional Season experience. 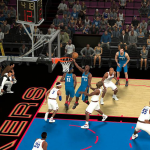 The expanded Season mode in NBA Live 99, with its multiseason play and dynamic features, laid the foundation for an even deeper mode. 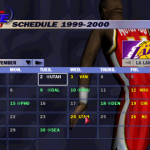 Come NBA Live 2000, basketball gamers wouldn’t have to wait any longer for a multiseason mode that replicated even more aspects of the real NBA season, including free agency and the rookie draft. Needless to say, it isn’t as deep as its successors, but looking back, it’s still impressive to see just how much EA were able to accomplish with that first iteration of Franchise Mode. Welcome to this week’s edition of The Friday Five! The Friday Five is a feature that I post every Friday in which I give my thoughts on a topic that’s related to NBA Live, NBA 2K, and other basketball video games, as well as the real NBA, and other areas of interest to our community. The feature is presented as either a list of five items, or in the form of a Top 5 countdown. This week’s Five is a list of five retro basketball gaming ideas that you might want to try out. The preview season for NBA Live 18 and NBA 2K18 isn’t quite in full swing yet, and although the 2017 NBA offseason is underway, a lot of the big names are already off the board. There are Summer League games to catch of course, but I expect that right now, a lot of basketball gamers are choosing to hit the virtual hardwood. Whether it’s LIVE or 2K Pro-Am, MyTEAM, MyCAREER, or perhaps a new MyLEAGUE or MyGM game with updated rosters, we’re finding ways to get our basketball fix while we wait for news on the upcoming video games, and the start of a brand new season. Of course, you may be looking for a change of pace, especially if you’re feeling a tad nostalgic, or a little bit burned out on the most recent games. To that end, you may want to dust off an old favourite, perhaps picking up where you left off in an old saved game, or possibly engaging in a little Achievement/Trophy hunting. On the other hand, if you’re looking for something new to do with a classic game, there’s a lot of fun to be had if you get a little creative, and enjoy “What If?” scenarios. If you’re looking for a little inspiration, I have five retro basketball gaming ideas to suggest. This is Wayback Wednesday, your midweek blast from the past! In this feature, we dig into the archives, look back at the history of basketball gaming, and indulge in some nostalgia. Check in every Wednesday for retrospectives and other features on older versions of NBA Live, NBA 2K, and old school basketball video games in general. You’ll also find old NLSC editorials re-published with added commentary, and other flashback content. 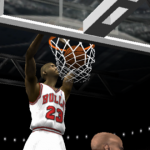 This week, I’m taking a look back at DSTATS in old NBA Live games. For an enthusiastic franchise mode gamer, detail is paramount. On top of having a quality gameplay experience throughout the schedule, our enjoyment of a franchise mode is driven by the depth of the features, as well as the accuracy and realism of trades, free agency, and player performance. Simulated player stats that are wildly inaccurate can really detract from the franchise experience, especially during the first couple of seasons which are usually expected to somewhat resemble reality. 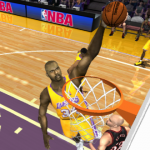 The sim engine is an area where basketball games have greatly improved over the years, but in earlier NBA Live titles, realistic stats were achieved through the use of DSTATS. Welcome to this week’s edition of The Friday Five! The Friday Five is a feature that I post every Friday in which I give my thoughts on a topic that’s related to NBA Live, NBA 2K, and other basketball video games, as well as the real NBA, and other areas of interest to our community. The feature is presented as either a list of five items, or in the form of a Top 5 countdown. This week’s Five is a countdown of the Top 5 PR Disasters in Basketball Gaming. Video games are serious business…well, just about as serious as a hobby can get, anyway. It’s a multi-billion dollar industry with passionate consumers who naturally want value for money, and to be valued by the companies making the products they’re buying. The relationship between gamers and developers can be contentious at times, and while our behaviour admittedly hasn’t always been exemplary, there are certainly times when EA Sports and Visual Concepts have made disappointing decisions, or acted in a way that left a lot of basketball gamers feeling unappreciated or ripped off. There have been several unfortunate incidents over the years, so as with any Top 5, I can’t account for all of them, and even if you do agree with my picks, you may not agree with the ranking. I’ve tried to base my selections on a combination of the severity of the incident, the long-term impact it’s had, and the general level of outrage that I’ve observed within the community. Finally, as always, these lists are intended to offer up my take on a subject while beginning the conversation, not ending it. With that being said, let’s tip off the countdown with number five.